Part History, part Comic Book, (a story book); this amazing series features the beautiful illustrations of Matt Maley and exciting story lines of Keith Karcher. Under development for nearly a year, each character is magnificently crafted, wrapped with suspenseful story-telling as the Far Fetchers leads you through an amazing tale of intrigue and discovery. 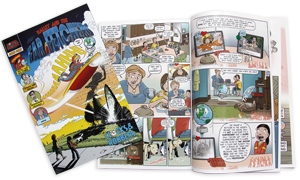 The Far Fetchers series is a wonderful companion for the World’s Greatest Search and Discover poster and can now be purchased online or at one of our featured retail venues.